Evguard™ is a film from Evguard which, once cured, is thermally stable. It has 3D reticulation capacity and does not contain plastifiers. It is currently the intermediate layer that offers the maximum quality in the glass and laminated polymer industry. It is also used in the manufacture of photovoltaic modules and intelligent glazings such as the LCD. It is patented and marketed by Folienwerk Wolfen GmbH, the largest manufacturer of rubber by products in the world. The unique characteristics of Evguard™ give laminated glass excellent durability and resistance to the passage of time as well as some superior optical and transparency qualities. On the other hand, it can be stored without special requirements and due to its strong adherence it presents excellent compatibility with various polymers and many other insertions. 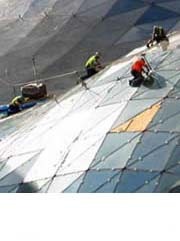 Thanks to Evguard™, the laminated glass industry is experiencing huge growth in the areas of architectural design and safety.